When it’s time to say goodbye to your faithful old dresser, don’t you dare take it to the dump! Just because you don’t want to store your clothes in it anymore doesn’t mean that your dresser is useless. There are so many ways you can upcycle your old dresser to transform it from a piece of junk to a centerpiece of your home. Here are 12 of our favorite ways to reinvent your old bureau. Always wanted a trendy island in your kitchen? Wish no more! In this simple project, you can reinvent your dresser as a functional pop of color in your kitchen, perfect for storage and style. Make your pup feel like the King or Queen of their domain with this dresser-turned-dog bed. This is a great way to give your pet their own comfortable space so they’re not shedding all over the furniture (no promises there, though) and you can keep the shelves underneath to store toys and cookies. Looking for an extra little accent piece for your home? Maybe just a place to take a load off? This easy to make DIY bench was once a kids’ dresser. With a new coat of paint and some fashionable cushions, it’s turned into a great accent bench for any place in your house. Most parents out there probably know that dollhouses (especially the big, beautiful ones) are expensive. If dropping a couple hundred dollars on a lovely dollhouse for your kids isn’t in the budget, use that old dresser and make your own! The drawers make for very convincing rooms and your kids will never know (or care) that this gift was made for next to nothing. If you’re obsessed with java, you’ll want to make it the focal point of your home. 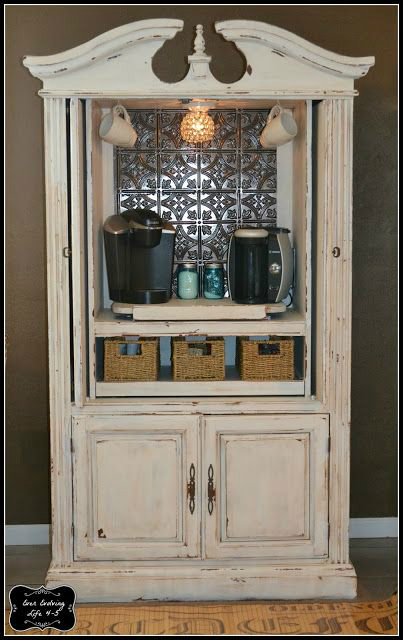 Make this DIY coffee station by re-purposing your old dresser to hold and display all your coffee needs. Loving the idea of a coffee bar in your kitchen? Check out some other coffee station ideas to get your imagination flowing. The many drawers of bureaus offer up a lot of room for your overflow of DVDs and video games! Paint your dresser a fun color and use it for your living room’s entertainment center rather than going out to buy a new, pricey one. If your mud room is a disaster, it might need a little organizational help. This dresser has transformed into a few different things – a bench, a place for storage, and a coat rack, all in one! You could even remove the bottom drawers and put in shoe rack for extra organization. Looking for a decorative place to store your alcohol and other beverages? This rolling bar was once a dresser and is now an extremely cool way to entertain and keep your drinks in order. For a really unique decor choice, turn your dresser into a bathroom sink. Granted, this DIY is not something you can snap your fingers and accomplish. If you want to hook up pipes through the bottom of the dresser to get the sink running, that will take some time, effort, and money. But if you’ve been looking for a project like this to liven up your bathroom, then look no further than this re-purposed dresser! No yard to speak of? That doesn’t mean your love of gardening has to go out the window! Make your own indoor garden using the spacious drawers of your old dresser. You can grow your plants AND have the most interesting conversation piece in any home ever. Buying a new hutch can be expensive, but if you have an excess of dishware and little shelf space in your kitchen, you’ll need one. Reinventing your dresser as your hutch is a cost-efficient way to get the space you need, all while adding a shabby-chic vibe to your kitchen. For a place to relax and take in the view (or to make some extra seating for entertaining) turn a smaller dresser into a window-side bench. We love the idea of making the top removable (or keeping in the drawers) and using it for storage or to keep books in. Want a few more ways to use your ready-to-toss dresser? Try using just the drawers to organize and decorate your home. Check out some of our favorite dresser drawer crafts here. If you’ve upcycled your dresser in a creative way, share your brilliance in the comments section below! We want to hear about what you created.